David Ruimveld is a self-taught artist, from Michigan. Ruimveld works with acrylic paints, using many washes to create stunning images of Angling, Sporting, and Wildlife Art. With a myriad of a watercolor style to his artwork and various fly-fishing paintings for sale, the studio offers something for any style. Ruimveld's paintings and prints are available for sale through many galleries, fly fishing shops, sporting outfitters, and private collections. 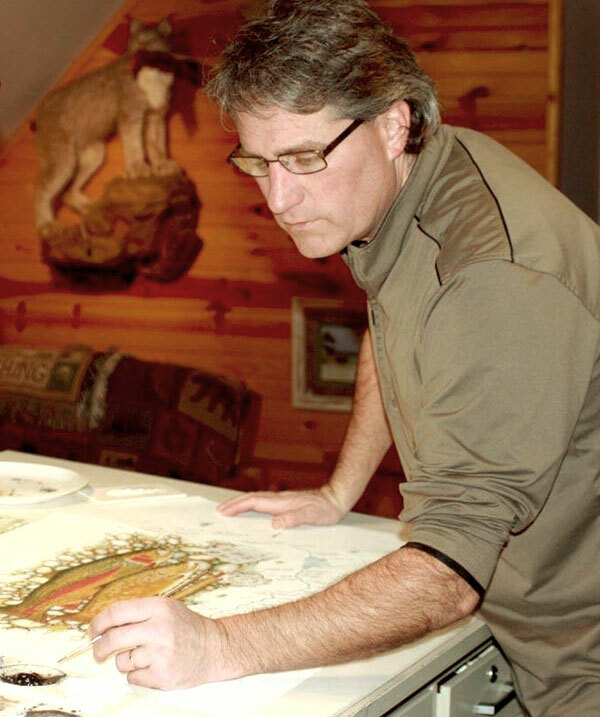 While he is well known for his paintings of the "Famous Rivers" series, he also enjoys creating images of bird dogs and upland game. Currently David is painting more originals and commissioned paintings that will not go to press as s/n prints. If you are wanting to add original paintings to your collection of art, contact him for availability of originals in various subjects and sizes. He admires and supports many of the conservation groups and will continue to do so. Believing that they are doing great works to preserve our heritage and the rights that we have to hunt,fish, and enjoy our great outdoors. I am a Christian and believe that God gave me the desire to be an artist for a reason. If I can encourage one person to open the Bible and look up one passage, then I have reached His goal. It may just save a life, answer a question, or reaffirm ones beliefs. I Praise Him and thank Him for sending His son Jesus to pardon me for my sins. There is no such thing as a good and perfect Christian, we have all sinned and fallen short of His glory. The Bible is full of words of wisdom to help us through our life. I encourage you to open it, study it, and start your relationship with GOD today. If you have any comments or questions please contact me. I would like to thank all of you who have supported my efforts through the purchase of a piece of my art, and in words of encouragement. I will do my best to create images that may rekindle memories that you may have made while enjoying the creation God has made.